Perhaps Martin Scorsese’s most neglected and least understood great film. An initial box-office bomb, it has looked more and more relevant with each passing year until finally the cancerous absurdity of real life has more or less surpassed it. 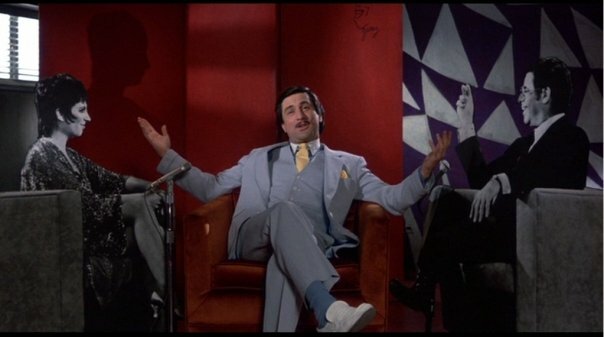 In a criminally underrated performance, Robert De Niro is Rupert Pupkin, a no-talent wannabe comedian who fancies himself a talk-show host like his idol, Jerry Langford (Jerry Lewis, brilliantly atoning for most of his career). De Niro creates a recognizable archetype of our culture, the lunatic who longs for the spotlight. His hand motions when Rupert first meets Jerry are first-rate — he’s like every star-struck fan who, presented with an actual star, can’t figure out what to say. But when Jerry rebuffs Rupert, the psycho joins forces with an even bigger psycho — the terrifying Sandra Bernhard as Masha, who’s in obsessive love with Jerry — to kidnap the star so that Rupert can get his shot on Jerry’s show. Rupert’s material is crude and unfunny, but today’s viewers won’t see much difference between him and twenty other undistinguished comedy-club hacks. An uncompromising and frightening black comedy that probably died of poisonous word-of-mouth because audiences saw Lewis’ name and assumed they were in for daffy slapstick.